Century Tube Acquired By Nucor Corp.
General Tire and NASCAR have announced a multi-year partnership naming the tire company the “Official Racing Tire” and “Exclusive Tire Supplier” of the NASCAR K&N Pro Series, NASCAR Pinty’s Series and NASCAR PEAK Mexico Series. 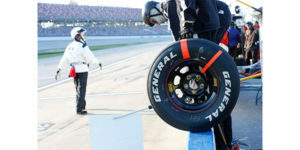 The tires will be manufactured in Lakeville, Indiana, where they have been building stock car tires for the ARCA Racing Series presented by Menards since 1995. The K&N Pro Series East kicked off the season for the NASCAR regional and international series on Sunday, Feb. 10 at Florida’s New Smyrna Speedway.